Thus candidates require detailed syllabus of Pre-exam & Main exam to qualify IBPS CWE V 2015 for selection of Probationary officers and Management Trainee in various departments. IBPS Syllabus will play a key role in preparation for Preliminary & Main Exam. It is not possible to prepare for IBPS exam without IBPS Syllabus. In the IBPS Syllabus, three various sections in Preliminary & five sections in Main examinations are present. IBPS Syllabus contains the detailed description of each section. It is important to every candidate to download IBPS Syllabus and exam pattern for CWE V 2015 PO MT posts. Candidates must go through IBPS Syllabus and exam pattern and get aware from number of questions, type of question paper, marks in each section & cut off marks required to qualify IBPS PO MT CWE V 2015 Preliminary & Main Exam. IBPS Exam Pattern tells about language of exam, marking scheme of exam, maximum marks and also a sampling of type of question paper. The online application will be available from 10th July 2015 to 01st August 2015 on official website www.ibps.in and interest candidates can applyonline for IBPS CWE V 2015 online application form of PO MT posts. Candidates can download IBPS syllabus for Preliminary & Main Common Written Examination and latest exam pattern for CWE V 2015 for PO & MT posts. · Merit List For Main Exam – Higher Marks in merit on the aggregate marks of the Objective Tests. IBPS Preliminary Exam 2015 will be conducted only for qualifying for Main Exam. NO MARKS of IBPS Preliminary Exam will be added into Final Merit List of the candidates for selection of PO / MT posts. IBPS Syllabus for PO MT CWE V Preliminary Exam 2015 Exam Syllabus Exam Pattern contains Topic Number of questions & Max Marks Candidates can download Reasoning tricks, English Tips Techniques, Math short cut tricks with memory techniques based on Time Management concept of read once and memorize forever to achieve good result and cut off marks in IBPS PO CWE V Exam 2015. Readers are advised to visit website frequently for getting latest news of latest jobs, admit cards, results, scorecard, counseling schedule and document verification of the candidates. Reader can get latest news of Haryana JBT Teachers Final Selection List, Chandigarh JBT NTT Document Verification, Chandigarh TGT recruitment latest news etc. on sscexamtricks.com. Besides this, readers can download tips-tricks & General Awareness questions answers sets for IBPS PO MT CWE V 2015 prepared from most popular books to the candidates to achieve cut off marks for IBPS PO MT CWE V 2015. IBPS PO MT Scores: The equi-percentile method will be used for normalizing corrected scores obtained by each of the candidates in different sessions in case candidates held in IBPS PO MT Exam 2015 for PO / MT posts. IBPS will use scores up to two decimal points for the purpose of calculations of Cut off Marks / Merit list of candidates. IBPS Cutoff Score for PO MT CWE V 2015: Candidates will have to qualify in each section by scoring minimum cut off marks in IBPS CWE V 2015. After getting minimum IBPS cut off marks, total marks obtained by the candidates in IBPS PO MT Main Exam 2015 will be considered for interview call for PO / MT posts. A cut off marks list will be prepared descending wise from the score obtained by the candidates in IBPS PO MT Main Exam 2015. Depending on the number of vacancies available, cutoffs will be decided and candidates will be shortlisted for interview. Prior to the completion of the interview process, scores obtained in the online examination will not be shared with the candidates shortlisted for interview. CANDIDATES MUST NOTE DOWN THAT MARKS SCORED BY THE CANDIDATES IN IBPS PO MT MAIN EXAM 2015 WILL BE CONSIDERED FOR PREPARING MERIT LIST / SHORTLISTING OF CANDIDATES FOR INTERVIEW AND FINAL SELECTION LIST OF THE CANDIDATES. IBPS PO CWE V 2015 Interview Pattern - The shortlisted candidates will be called for interview in which proficiency in local language will be tested. The total marks 100 marks are allotted for Interview. The minimum qualifying marks required to qualify interview with proficiency in local language will be more than 40% for General / OBC Category candidates and 35% for SC/ST category candidates. 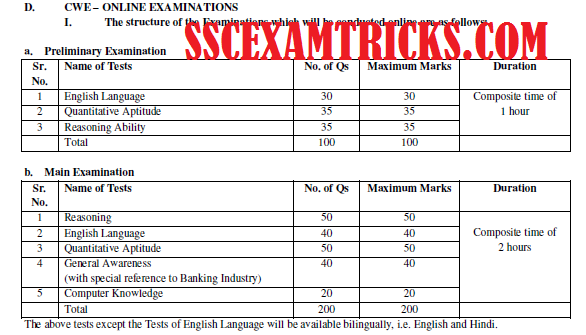 The weightage of marks of CWE and interview will be in 70-30 ratio respectively. IBPS PO / MT CWE V 2015 Final Selection - The final selection of the candidates will be made on basis of performance in online common written examination (CWE) and personal Interview of candidates. IBPS PO CWE V Exam 2015 will be held on various dates in the month of September 2015. The tentative dates for IBPS PO CWE V Exam 2015 can be downloaded from official website. 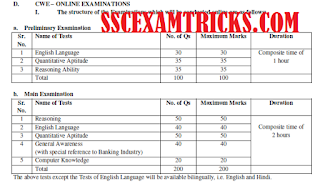 Visit Regularly on sscexamtrick.com for getting latest news about SSC CHSL latest jobs, admit cards, results, scorecard, counseling schedule and document verification of the candidates. Furthermore readers can download tips-tricks & General Awareness questions answers sets for IBPS PO MT CWE V 2015 prepared from most popular books to the candidates to achieve cut off marks for IBPS PO MT CWE V 2015.